This cute sign is easy to decorate! View the tutorial to see how we did it! 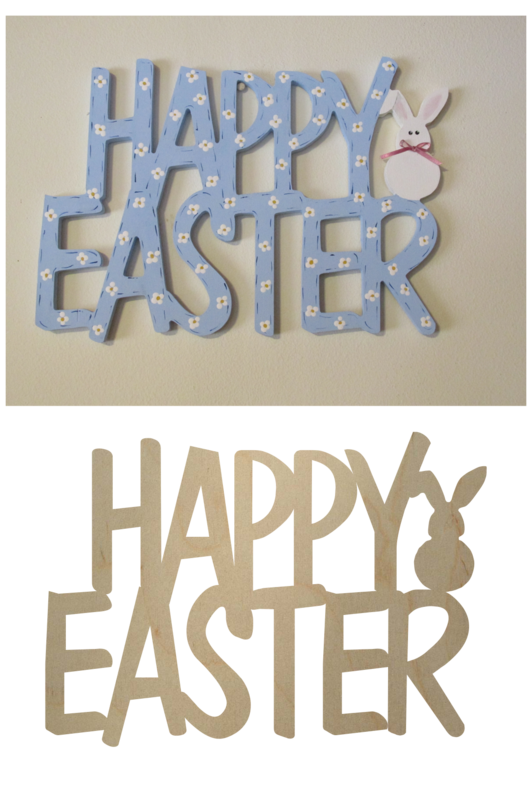 This cute wooden Happy Easter sign is a perfect addition to your decor for the holiday! We offer this in a wide variety of sizes and thicknesses. This allows you to get exactly what you are looking for! The 1/8″ is available down to 4 inches wide and would be ideal as a decor piece on a wreath (or even as a pin). The 1/4″ thickness would be perfect to go across a wreath as the smaller we offer is 12″ wide. The 1/2″ and thicker would be perfect for those wanting to decorate this as a center piece. We use only the highest quality material available to us! Our plywood is stable and doesn’t have any of the voids often found in other plywoods. It is also stronger than MDF and won’t swell up when it gets wet, however we don’t recommend it to be used outside.